Early career scientists (ECS) make up a significant proportion of the EGU membership and it’s important to us that your voices get heard. One way to do this is to get in touch with your early career scientists representative, or better yet, volunteering to get involved in your division/programme group. While the division ECS representatives gather feedback from early career researchers in their fields, the Union-level ECS representative gathers information from each of the division representatives and takes it to the EGU’s Programme Committee and Council, ensuring the needs of early career researchers in the Earth planetary and space sciences are met at the General Assembly, and throughout the year. Raffaele is a postdoctoral research focusing mainly on flood risk modeling and management. Early career scientists representatives are the vital link between the Union and its early career scientists membership. They give a voice to early career researchers in the Earth planetary and space sciences and ensure their needs are met at the Assembly, and throughout the year. If you have any questions, comments, thoughts or ideas for the next Assembly, don’t hesitate to get in touch with them, they’d love to hear from you! Carole is lecturer in physical geography at the University of Rouen (France) since September 2016 with expertise in limestone geomorphology, cave monitoring and palaeoclimate reconstruction from geochemical proxys. A former postdoc fellow at the AMGC research group, Vrije Universiteit Brussels and the Royal Belgian Institute of Natural Sciences, she worked on the reconstruction of past climate in the Levant from geochemical proxys in speleothems. In her new role as the Climate Division ECS representative, Carole with her team hopes to build a strong ECS network in climate and contribute to making the EGU General Assembly a fruitful experience for ECS. Anita is currently a research technician at the Lancaster Environmental Centre of Lancaster University (UK), researching the palaeoclimate evolution from the late Pleistocene to the Holocene on African sediments using rock magnetism and the Earth’s magnetic field behaviour. She is a geologist and geophysicist with interest in rock magnetism and palaeomagnetism applications to date and correlate volcanic deposits, reconstruct rotation patterns in mega-faults and palaeo-oceanic crust, and understand the origin, evolution and behaviour of the Earth’s Precambrian and Pleistocene-Holocene magnetic field. As the EMRP ECS representative, Anita plans to bring more networking opportunities between ECS and job makers. She hopes to introduce a new platform in support of mental health for ECS and to raise the visibility of LGBTI+ and underrepresented categories within ECS (gender, disability, ethnicity..). Mathis is a postdoctoral reasearch associate at the Deutsches Geodätisches Forschungsinstitut der Technischen Universität München (DGFI-TUM). His main research topics are reference frames, satellite laser ranging, precise orbit determination of near-Earth satellites and the combination of space geodetic techniques. With his research, Mathis wants to push Geodesy beyond the provision of geodetic measurement time series towards a multi-disciplinary science including the interpretation of the observed Earth system changes. As an ECS Representative, he tries to accomplish that new EGU attendees easily find their way through the EGU tangle. He also works together with Katrin Bentele (TU Graz) on stenghtening the G division social media appearance. Nico is a PhD student in Geophysics at Durham University, England. He is working on numerical modelling of subduction and collision zone dynamics and on how to ideally link dynamical models with petrological software to understand both the effects of dynamics on magmatism, and, vice versa. As an ECS representative, he is working towards strengthening the link between neighbouring divisions and firmly establishing the recently introduced Geodynamics events at the EGU General Assembly. He would like to understand EGU’s internal structure and explore where ECS participation is desirable and effective. 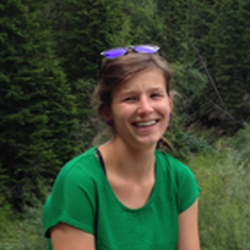 Micha is a post doctoral researcher at the German Research Centre for Geosciences GFZ Potsdam. He works in the Geomorphology section and is focused on Environmental Seismology, i.e., exploiting the seismic signals emitted by Earth surface processes to detect, locate, track and quantify the processes that shape our planet. He contributed to the EGU conference by organising/co-convening several sessions and has served as representative of the German Young Geomorphologists a few years ago. Gwyn is a postdoctoral researcher at the University of Southampton, UK. His work focuses on measuring the interactions between mesoscale eddies and the western boundaries of ocean basins as part of the MerMEED project. As EGU’s Ocean Sciences ECS representative, Gwyn plans to further promote the EGU early career platform through outreach and ECS events to ensure that as many ECSs from all backgrounds have access to the same range of resources. He is keen to encourage the development of a diverse (gender, disability, ethnicity and LGBT) ECS community. Gwyn also hopes to introduce into the ECS platform at EGU discussion of and support for mental health in academia. I am a physicist/space scientist. I am currently a PhD at the University of Bern/Switzerland (Physics Institute, Space Research and Planetary Sciences division). In my PhD I worked on in situ laser mass spectrometry for planetary exploration. I will finish the PhD this months and stay in Bern as a PostDoc until November. Then I will start a PostDoc at IRF (Swedish Institute for Space Physics) in Kiruna/Sweden, working on the JUICE (Jupiter Icy Moons Explorer) mission, more detailed on the JNA (Jupiter Neutral Atoms) instrument. I am very happy that we, the PS ECS, are (already) a small active team. We organise workshops, short courses and small contests, not only at the EGU GA, but also at other conferences related to space science (European Planetary Science Congress, for example). Nienke is a seismologist who works on imaging the Earth’s interior based on the vibrations emitted as a result of earthquakes. She is a postdoctoral research associate at the University of Cambridge and works on seismic waveform tomography, with a specific interest in developing methods to image density. She enjoys reading a good book, hiking, cycling, and cooking. As ECS rep, she works towards outreach to the community and beyond, and integration and communication between disciplines. In this light, she collaborates with the TS and GD divisions to set up a series of short courses on the “Solid Earth 101,” aimed at early career students and with a specific focus on integration between disciplines. This builds upon the EGU short course “Seismology for non-seismologists,” which she’s already helped organise for the past couple of years. Steffen is in his last year of PhD at the Technical University of Munich, Germany. His work focuses on the formation and composition of soil microaggregates, especially analyzing spatial distribution patterns of organic matter at the microscale. As an ECS representative, he aims to create more interdisciplinary links between different subdivisions and stay in touch with other divisions. To achieve this together with a bunch of great people, Steffen is actively involved in organizing science-policy debates, enable more creative community actions like stickers, and sustaining the opportunity for all soil-related ECS to meet informally over dinner and a beer. By exchanging ideas with various soil science societies, Steffen thinks it is very important for the global soil science community to connect the dots and put complex environmental systems like soils in the center of our scientific efforts. If you have enthusiastic ideas about the SSS division do not hesitate to get in touch with him. Theresa is in her third year of her PhD at the Arctic University of Norway in Tromsø. She is working with active experiments and Incoherent scatter radars studying the electromagnetic wave and plasma interactions in the ionosphere and space. As ECS rep, she and her small team aim to create and contribute to an active early career scientist community in the ST division. They organise a popular short course (Meet the Experts – The future of solar terrestrial research) to bring together established researchers and ECS to talk and discuss the future and challenges of our field. Anouk is in her last year her PhD. She works on continental break-off processes at a lithosphere scale using numerical and analogue modelling. As the TS ECS Division Representative she’d like to motivate people to join activities and become involved in the community. She is very lucky with the TS team and hopes more people get enthusiastic.